Up at six, we drive to the Shute Harbour ferry terminal. The water is glassy, pink with the dawn light. A few early fishermen stand on the jetty casting lines into the mist. The ferry terminal is quiet. A mobile coffee seller opens up the back of his vehicle, ready to start his day. The milky coffee is welcome, warming our hands as we stand and wait for the 7:30 ferry. The smell of coffee mingles with the fresh salty scent of the ocean. 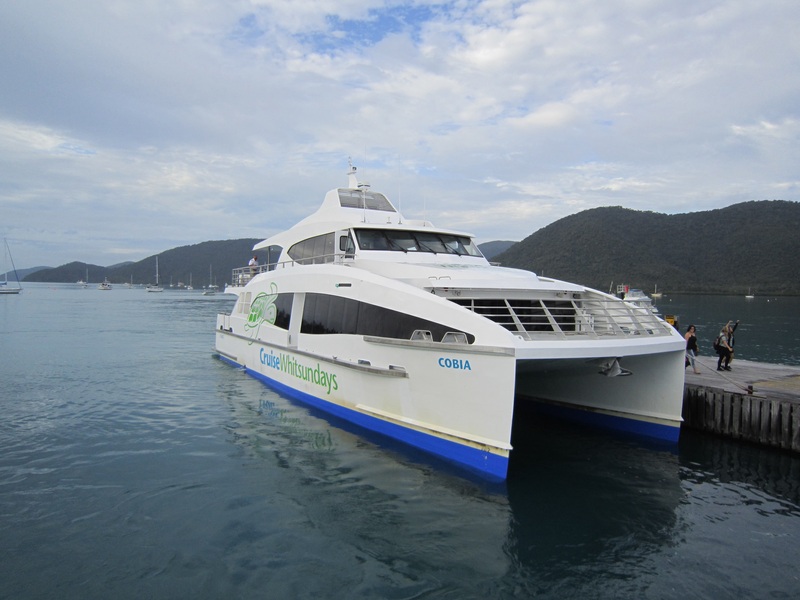 These days, most ferries to Hamilton Island leave from Airlie Beach. The terminal here at Shute Harbour is running down. The ticket office is closed. Rust pockmarks the skin of the white painted structure. But still, it’s a beautiful view across the water to the islands. The ferry finally arrives and we line up to get on. The thirty minute trip gives us our first view of the Whitsundays. Steep rocky cliffs covered with dark green vegetation rise out of the ocean blue. Many of the islands are set aside as national parks and have few signs of human habitation. We point at the occasional home, perched on the slopes, enjoying the perfect view. What would it be like to live there? Hamilton Island is bustling with life. Electric golf buggies swarm over the island, a quick easy mode of transport for tourists and locals alike. We have a few hours to kill before the yacht is ready. It’s time to explore the island. The free orange shuttle bus stops for us and we climb up out of the town through manicured gardens and grand design houses, catching glimpses of the sea view at every turn. The roads wind up and up until we stop at a panoramic lookout in the heights. The bus rings with oohs, aahs and the click of our photographers as we capture the view. Back on the waterfront, the yacht is packed with provisions. The briefing doesn’t take long and soon we are on our way. For our first night we decide to stop on the northeast of Henning Island, only about nine nautical miles from the Sunsail base. We motor up the Whitsunday passage, getting to know Rhythm, our 44 foot monohull yacht. The crew are dosed to the eyeballs with ginger seasickness remedies, testing their sea legs. I see no green faces. All is good. Henning Island is a relatively quiet spot near a small sandy beach. Able Seaman Jeffery catches the line on a blue mooring buoy, I tie it and we are set for the night. We share a hearty dinner around the cockpit table, enjoying our first evening at sea. It’s hard to relax when moored at night and we regularly check the line to the buoy. We fiddle with the line. It’s a mistake we regret when we end up with the buoy trapped on the starboard side of the yacht. After much debate we decide to leave the buoy as it is for the night. Able Seaman Jeffery makes one last reconnaissance mission to the bow and shouts as the line slips. He grabs at it and holds it for minutes in his bare hands until he has to let it go, and we find the yacht unexpectedly detached from the mooring buoy in the dark. A surge of adrenalin and we all jump into action. The mooring line is reset. No harm done. Sleep now. Tomorrow we start our yachting adventure. This entry was posted in Australia, Sailing and tagged Australia, Sailing, Travel on 07/06/2015 by Deb McSephney.